The Bellevue Arts and Crafts Fair has got to be our favorite festival or fair to go to in all of Washington. 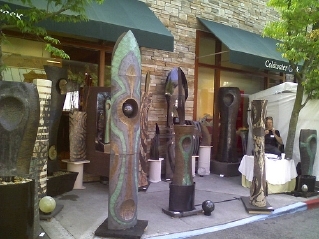 My wife first took me to the Bellevue Arts Fair when we were just married and I had a blast. Unbeknownst to me at the time, she had been to the fair many times before, as she had grown up right down the street from downtown Bellevue. That being said, while she knew what to expect, I had no idea what was in store for me until I actually saw the streets lined with hundreds of different vendors selling everything you could imagine, along with many things you could never imagine. To give you a little perspective on what makes this fair so awesome, we need to go back in time just a little bit. It was the 1940s, and a man by the name of Carl Pefley owned a restaurant called the Crabapple Restaurant, and decorated his business with the artwork of a lot of local artists. This artwork was very popular with the clientele, and it wasn't too long before he was selling the art for the artists. From there it wasn't a very big jump for Carl and his wife to start their own art show. This first show kicked off in 1947 and was called Bellevue's Pacific Northwest Arts Fair. This first fair already had an attendance of nearly 30,000 people, and by the time the next year rolled around, the number of people attending almost doubled. So from the not-so-humble beginnings in 1947, the Bellevue Arts and Crafts Fair has grown considerably, with current attendance every year hovering around 300,000 people over the course of the three days. This free outdoor arts festival takes place every July (towards the end of the month) and is really a great place to some cool exhibits and find some great gifts, either for yourself or for others. The first year my wife and I attended, there were booths selling all kinds of unique items. Some of my favorite were the crafts made out of wood or leather. My wife particularly enjoyed the ceramic dishes and cool paintings. Whatever your preferred art medium is, you'll find it at the Bellevue Arts and Crafts Fair. And who knows, with all the creative juices that are flowing around during the fair, you might find something that even inspires you to create something fabulous! Back from Bellevue Arts and Crafts Fair.